The Dog Biscuit: Homemade Dog Treats, Dog Food Recipes and More! Homemade Dog Food Recipes, Organic Puppy Food, Treats and More! The Dog Biscuit website provides information on the best dog food and shares homemade dog treats and homemade dog food recipes. From natural, organic puppy food, to information on raw dog food diet, commercial pet food comparisons, health info, training tips and more. In this age of chemically-laden, commercially produced pet foods and treats, we believe it is important for us to offer wholesome, nutritious (and even organic when possible) alternatives for the health of your pet. If you want your pet to stay with you a long time, you need to start feeding healthy, nutritious food and treats from day one! The main theme of our website is focused on providing the best dog food nutrition in the form of pet food and treat recipes. However, we do include other related topics, such as: a Dog Food Comparison section; information focused on New Puppy Care (including organic puppy food); and more. There are great homemade alternatives to commercial pet food but not all commercial food or treats are bad; so, here you have a chance to share pet food reviews of commercial food, recipes, and other canine care tips. We'd really like to hear what works for your pet, and what doesn't (our Rhodesian Ridgeback loves all food and treats so will eat the food, but if she's allergic to some of the ingredients she'll throw up or have diarrhea shortly thereafter). NEW!! 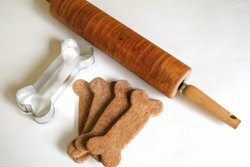 Share your favorite homemade dog treats and recipes with us! Best Dog Toys: your pooch needs interactive games and toys to play with and to keep occupied. Dogs Health Info with information on grooming, how to handle allergies, infections, sickness and more; pet health insurance and, of course, nutrition. The Best Business to Start if You Love Working with Canines: Overnight stays, Taking Dogs Walking, Doggie Day Care, Sitting for Dogs, Trainers - for Dogs and their owners, and more. 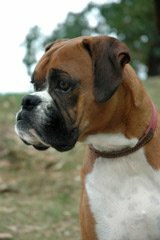 All About Dogs; includes information on pet supplies and caring for your canine. Dog Training Tips: training for both you and your pet. Use fun games to teach your pet tricks, engage your canine (if he or she is not bored then your pet won't get into trouble) and help your poochs behavior. Dogs of the Day: this is where you get to share a favorite picture of your pooch - lets make your pet famous! Use this site to find good recipes, good resources, and good tips on the care and well-being of your canine! Your pooch can be a great member of your family; and just like with other family members, you need to spend time together, play together, take care of each other. Canines are wonderful pets, and a great addition to your family! Visit Dog Biscuit Recipes for more treats recipes. Visit The Dog Biscuit Sitemap to explore other topics on this site. 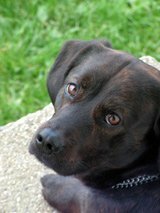 And check out the Homemade Dog Treats Blog for the latest information on The Dog Biscuit Site. Get the Homemade Dog Treats Blog widget and many other great free widgets at Widgetbox!